Julkrubba (32x18 cm) i trä i 9 delar. Herde (6 cm) med 3 st. får (4 cm) i trä. 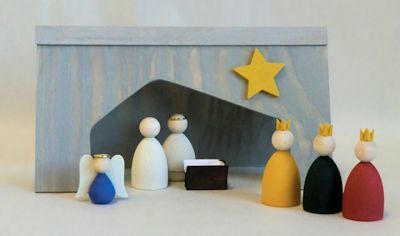 _______________________________________________________________________ Christmas crib (32x18 cm) in wood in 9 pcs. Shepherd (6 cm) with 3 Sheep (4 cm) in wood.